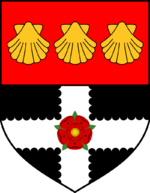 The University of Reading is a university in the English town of Reading, Berkshire. Established in 1892, receiving its Royal Charter in 1926, the University has a long tradition of research, education and training at a local, national and international level. It was awarded the Queen's Anniversary Prize for Higher and Further Education in 1998, and again in 2005. It is one of the ten most research-intensive universities in the UK, as well as being considered one of the top 200 universities in the world. The University owes its origins to the Schools of Art and Science established in Reading in 1860 and 1870. These became part of an extension college of Christ Church of the University of Oxford in 1892, which became known as University College, Reading. The new college received its first treasury grant in 1901. Three years later it was given a site, in London Road, by the Palmer family of Huntley & Palmers fame. The same family's continued support enabled the opening of Wantage Hall in 1908 and the Research Institute in Dairying in 1912. The college first applied for a Royal Charter in 1920 but was unsuccessful at that time. However a second petition, in 1925, was successful, and the charter was officially granted on March 17, 1926. With the charter, the University College became the University of Reading, the only new university to be created in England between the two world wars. In 1947 the University purchased Whiteknights Park, which was to become its principal, Red Brick, campus.In 1982 the University merged with Bulmershe College of Higher Education, in the process acquiring its third campus. In 1984 the University started a merger with Bulmershe College of Higher Education, which was completed in 1989. In October 2006, the Senior Management Board proposed the closure of its Physics Department to future undergraduate application. This was ascribed to financial reasons and lack of alternative ideas and caused considerable controversy, not least a debate in Parliament over the closure which prompted heated discussion of higher education issues in general. On October 10th the Senate voted to close the Department of Physics, a move confirmed by the Council on November 20th. Other departments closed in recent years include Music, Sociology, Geology, and Mechanical Engineering. In January 2008, the University announced its merger with the Henley Management College to create the university's new Henley Business School, bringing together Henley College's expertise in MBAs with the University's existing Business School and ICMA Centre. The merger took formal effect on the 1st August 2008, with the new business school split across the university's existing Whiteknights Campus and its new Greenlands Campus that formerly housed Henley Management College.